Doctor Chris Taylor, left, examines the ear of Medi-Cal patient Richardo Alvarez, 5, at the Las Palmas Health Clinic in Sacramento, Calif. Medi-Cal is the California Medicaid welfare program serving low-income families, seniors, persons with disabilities, children in foster care, pregnant women, and certain low-income adults. In June 2012, the Supreme Court ruled on the constitutionality of key components of the Affordable Care Act; and foremost among these were the individual mandate and Medicaid expansion. The Court judged the former to be constitutional but allowed states to "opt out" of the Medicaid expansion and some states have indicated that they will exercise this option. How might state choices affect health care coverage and costs? The Patient Protection and Affordable Care Act (ACA) provides for three basic ways to increase health insurance coverage: the expansion of Medicaid to cover the poorest population; the provision of subsidies for those with low or medium incomes to purchase coverage on the new health insurance exchanges; and the institution of an individual mandate requiring everyone to have insurance. Taken as a whole, the ACA is highly controversial. However, Medicaid expansion and the individual mandate are particularly contentious issues, and the constitutionality of both was challenged, ultimately landing on the docket of the Supreme Court. In June 2012, the Court ruled that the individual mandate was constitutional but gave states the option of not participating in the Medicaid expansion slated to begin in 2014. As of the spring of 2013, governors from 14 states had indicated publicly that they will choose to opt out. The state-by-state breakdown as of spring, 2013. 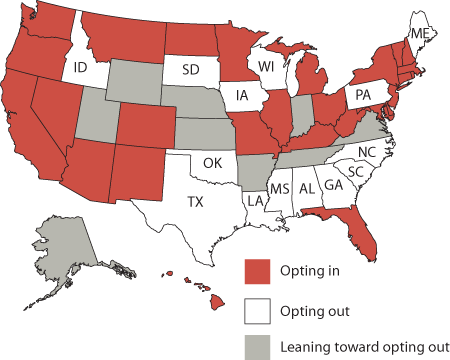 States where governors have stated they will not expand Medicaid are indicated in white, states that are leaning toward opting out or seeking alternative options are indicated in gray, and the remainder are red. What does Medicaid expansion offer states? More federal Medicaid funds: Under the ACA, the federal government will pay 100 percent of the coverage costs for those newly insured under Medicaid expansion. After 2016, the federal share gradually shrinks to 90 percent, substantially more than the 57 percent they currently pay on average. Greater access to care for the poor: Medicaid expansion makes health care more accessible to the poorest segment of the population — those earning less than 138 percent of the federal poverty level (this amounts to an income of about $16,000 for a single person or $32,000 for a family of four in 2013). Reduced outlays for uncompensated care: Providing insurance to the very poor reduces uncompensated costs of treatment for this group — an estimated $80 billion in 2016. Currently, about one-third of these expenditures come from state coffers. Reduces financial risk for the lowest-income Americans: Analysis of Oregon's Medicaid experiment found that the financial hardship associated with medical coverage was dramatically reduced. 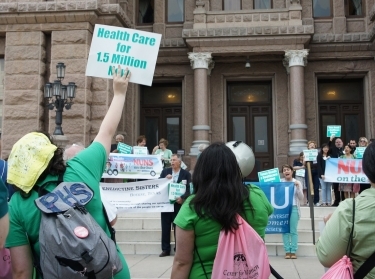 Without Medicaid expansion, the poorest population could fall through a coverage gap. If states decide not to participate in Medicaid expansion, individuals with incomes at or up to 1.38 times the federal poverty level would qualify for federal subsidies toward participation in the new health insurance exchanges. But those earning less than the federal poverty level are not eligible for subsidies, potentially leaving those at the very bottom of the income ladder without viable coverage options. State-level policymakers seek to understand how decisions about Medicaid and federal subsidies might affect state budgets, as well as their population's health. Simulation models provide a quantitative means for predicting what will happen in the kinds of multiple futures that decisionmakers care about. RAND's Comprehensive Assessment of Reform Efforts (COMPARE) model can help to predict the decisions that individuals, families, and firms will make under various possible scenarios. The Opt-out scenario is the most likely of these futures, given the Supreme Court's decision. To fully gauge the effect of states opting out of the expansion, we contrast the outcome under the current situation (14 states choosing to opt out) with a possible future in which all states expand Medicaid. Full Medicaid expansion would newly enroll 16.2 million residents, a substantial portion of the 27.4 million individuals who would become newly insured under full implementation of the ACA. Without Medicaid expansion in the 14 states that have indicated they will opt out, the ranks of the newly insured will shrink by about 3.6 million. However, some of the state-level cost of Medicaid expansion would be offset by the savings from less uncompensated care brought on by increases in the percentage of patients with insurance coverage. Thus, on net, states that expand Medicaid might well spend less on the uninsured until 2020, or perhaps beyond, than without the Affordable Care Act. Three additional options would require some federal legislative or regulatory action. What could be done about the coverage gap for low-income populations? Without Medicaid expansion, individuals with incomes at or below the federal poverty level will have no viable access to health coverage. Congress could amend the ACA to extend federal subsidies to this group with negligible net effect since the cost to subsidize this population is about the same as the savings that would be gained from reductions in uncompensated care. In this alternative future (number four from our list above), an estimated 1.1 million more people would have access to insurance in the 14 states currently planning not to expand Medicaid, still leaving roughly 27 million people uninsured nationwide. Alternatively, if Congress allowed states to expand Medicaid only to people with incomes up to 100 percent of the federal poverty level and the 14 states currently planning to opt out entirely choose to do so, about 54.4 million people would be covered under Medicaid — 8.5 million fewer than if the ACA were fully implemented. About half of the people not enrolled in Medicaid would be covered through an exchange, but 3.6 million more people would be uninsured. Access to care has been found to reduce mortality, but those newly covered under Medicaid may not have ready access to care. Medicaid's low compensation rates often lead providers to turn down Medicaid patients. Expansion will increase the number of people seeking care, but gaining access to care may be difficult, because fewer physicians are willing to participate. Increasing Medicaid's compensation rate could attract additional providers. Medicaid expansion is a moving target. Estimating the overall effects of Medicaid expansion is especially challenging because state decisions about whether or not to expand Medicaid are unfolding right now. As a result, RAND researchers had to determine state participation based on what state governors said they intended to do. Whether or not those intentions will translate to action is not certain. If more states opt out of expansion, the decrease in coverage and federal payments to states will be greater and the increase in uncompensated care costs for states will be higher. In addition, states are also currently deciding how to design their health insurance exchanges and other dimensions of the ACA. If states make enrolling in health insurance easier, especially the ease with which eligible people can enroll in Medicaid, enrollment numbers could be higher. 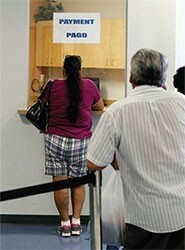 Alternatively, if states make enrollment difficult, effects could be smaller. RAND's analysis suggests that Medicaid expansion is an effective way for states to expand insurance coverage. Expansion is also a good fiscal choice: Even states that opt out will be subject to various reductions (such as the reductions in Medicare spending) and taxes stipulated in the ACA. Thus, states that choose not expand Medicaid may experience a large net transfer of federal funds out of the state. However, it is unlikely that all states will choose expansion, at least in the near term. In the interim, extending federal subsidies to the poorest population could somewhat blunt the effect of a state's non-expansion decision and slightly increase the number of individuals covered. And while a regulatory change that allows states to only partially expand Medicaid to the poorest residents (those with incomes at or below the federal poverty level) would shift some state costs to the federal government, this policy would have little effect on the number of people covered. Price, Carter C. and Christine Eibner, The Math of State Medicaid Expansion. Santa Monica, CA: RAND Corporation, 2013. https://www.rand.org/pubs/research_briefs/RB9706.html.